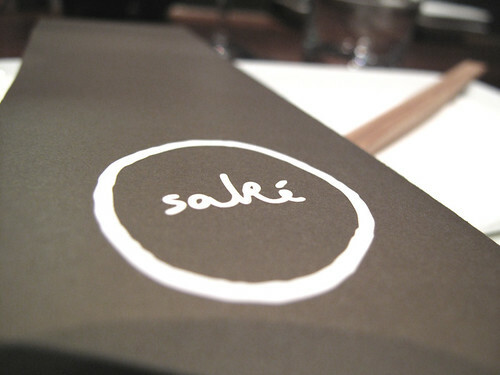 Sake Restaurant & Bar | A Weblog about.... food. I love Fridays. Things are always more relaxed on Fridays, people a little friendlier and more at ease about filling themselves up with copious amounts of alcohol (if they so choose – I tend to). It’s also a good time to be out and about in the city, there’s less dressing up and more hair down and the best part of it all is that it’s the longest amount of time you get to enjoy yourself until you have to go back into work, and therein lies the essence of a good time right?… having nothing to worry about. I used to love Saturdays too but I’ve realised that with age also comes a longer recovery time, so these days my Saturdays are more often than not quiet 2 pizzas and beer affairs. Now most Fridays will generally see me forgo any nutritional sustenance as soon as I’ve finished work in favour of a refreshing beverage or 20. Ask anyone in the fashion industry (not that I’m in it…I think I may have seen this in The Devil Wears Prada) and one of the first things they’ll tell you is that an alcohol fuelled evening is extremely calorific. I reason that by not eating beforehand I’m able to maintain my incredible physique (of course this all goes to waste when I find myself at a certain fried chicken establishment on one of Sydney’s main strips post 2 AM). Last Friday night I didn’t dance on table tops or have too many shots but I did find myself at Sake Restaurant & Bar. 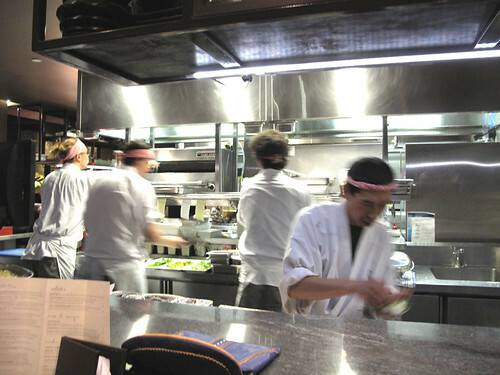 Shaun Presland’s take on modern Japanese has been a star in Sydney’s dining scene in the last couple of years and this has been reflected by its hatting 2 years running since opening. I’ve been here a couple of times prior but allergies to shellfish meant that I missed out on some of their more well-known dishes (popcorn shrimp – Masterchef), but knowing you only live once I’ve been taking my chances of late (yes I see the irony in eating something that could potentially stop one’s life in order to live one’s life). The menu here is made for sharing and with there being four of us we order a whole bunch of different items. 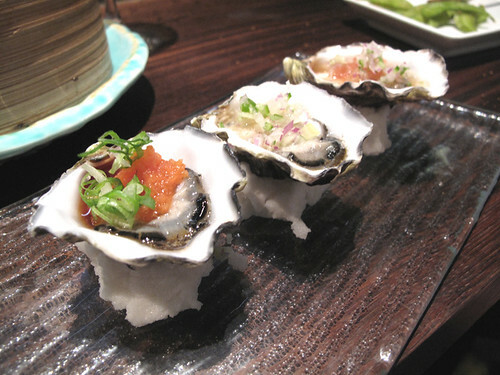 We start off with the oysters that have been picked off the specials menu. Light and creamy with a nice citrus twang provided by the peruvian inspired toppings these are a great way to get us into the evening. 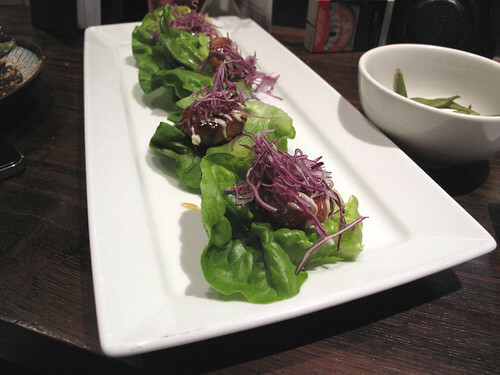 These pink sashimi tacos (wink wink) are among the best I’ve ever had. Best what? Tacos, yes. Sashimi, yes. 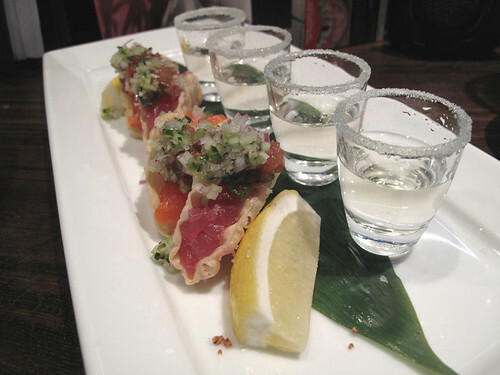 These are seriously that good and whats even better is the sake shooters bring that mexican vibe around even more. Once again there’s a strong citrus twang all round and I’m feeling all good and zingy after this. This is a regular order for me whenever I come to Sake, and once again I’m brought to my happy place. 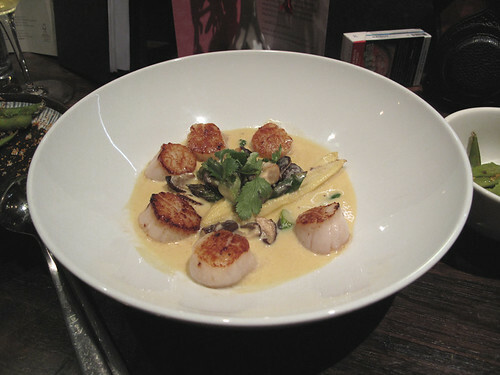 The miso, cream and citrus flavours all combine to create a lovely velvety sauce and I can’t help myself from spooning the sauce into my mouth once the scallops are all gone. When I accidentally ate some prawns a few weeks earlier and was left unaffected I became excited by the possibilities. This is one of the dishes I’d been dreaming about, if only for my love of popcorn chicken (don’t hate on me). This didn’t dissapoint, and although I knew I was pushing my luck by going back for more, I just couldn’t resist. Feeling quite full but still having quite abit of wine to contend with we decided to order a couple more dishes just so the wine wouldn’t feel so lonely. 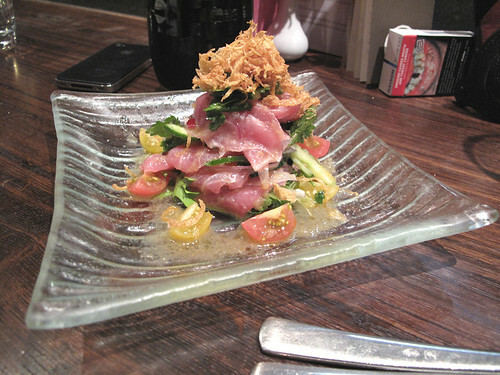 First was the tuna ceviche, which was more of a sashimi with citrus flavours then a traditional ceviche, but amazing nonetheless. Possibly my favourite dish of the evening. 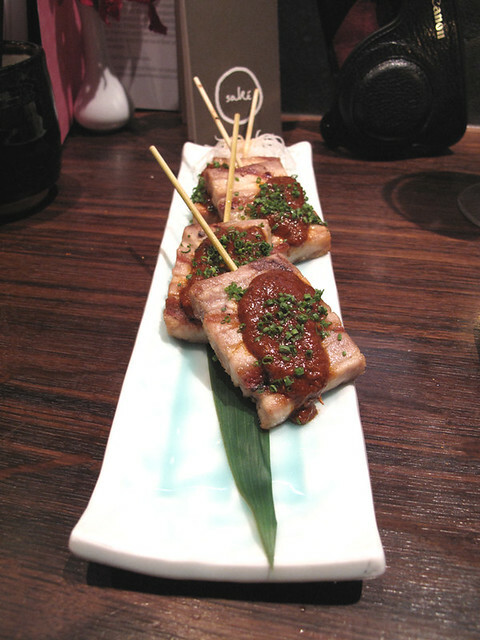 Further to that these are possibly the best pork belly skewers I’ve ever had. The only one that comes close is one I had a couple of years back in some back alley yakitori joint in Ueno (theres actually a pic of it in my first ever post if you care to read it). These just melted in the mouth and the Peruvian ‘anticucho’ sauce blended nicely with the fat. Probably the only dissapointment of the night for me. I’m not much of a sweet tooth and always prefer to end a meal with something savoury so I may not be the best judge, however I just found it to be a little too sour for my tastes. It probably would have been great with the ice cream but another diner decided to steal mine. I wanted this dish to be great as we were sitting in front of the dessert/ pasrty chef and she was a total cutie. I heard somewhere once that your allergies renew themselves every seven years or so. You drop old ones or you may even pick up new ones. I think this is what I’m going through right now, as I didn’t break out all Hitch like post meal. Yes, I did have an intense need to vomit that not even a quickly inhaled cigarette or quick chomp of a mint could help me through…. But hey these things take time, and what do they say about good things and those who wait? 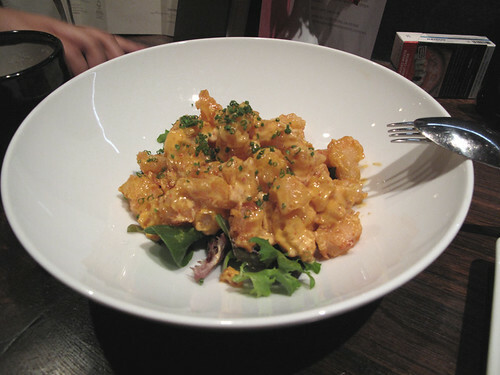 I’ve been to Sake once and loved the food there, oh gosh the miso cream scallops and the popcorn shrimp does look absolutely delicious! Yuzu is quite sour so it was probably true to taste. Tacos, eh? I like the look of the…*searches the photos for something vaguely phallic* skewers? Seriously though, I’ve been here a few times, and the last time I was pretty disappointed with the quality of food and service. Looks like I’ll have to return, because it’s looking pretty good right now. 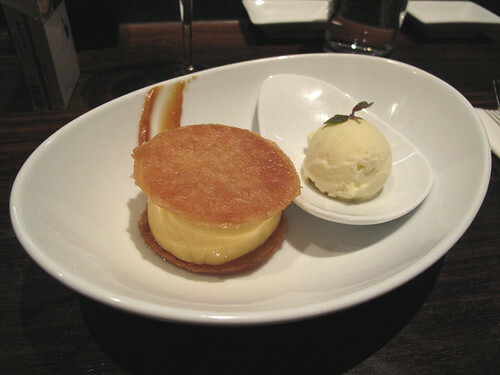 vivian – yeah I think i’m just not a fan of sour and sweet, i love yuzu in savoury dishes though! joseph – yeah its a miracle i tell you! eden – lol… kebabs taste far better with alcohol lining the stomachs. actually theres a really good dodgy kebab joint in pyrmont next tot he pyrmont bridge hotel that does berlin style kebabs with coleslaw instead of lettuce and whatnot… its good! – and I feel your sisters pain, the last time this happened to me was 2 years ago after yumcha… not a nice feeling i tell you! Dumpling girl – the menu was printed… so maybe? lol… anyway just go go go! I am a victim of that Friday affliction also, I do love a good burger at 3 am, preferably something slathered in bacon and mayonnaise. Feeking delicious. All of the above looks divine, NZ has about 3 relatively good Japanese restaurants but nothing like Sake. Ive been told to visit and now I think I must. but someone in singapore had already taken it. must be a smart person. ive read so many reviews.. i really need to visist sake soon!